The life of every Christian soul on it’s pilgrimage through this vale of tears must be fed primarily on two foods. The origin of these two foods is the two trees in the Eden of our first parents, of which trees one was allowed to their use and one was forbidden. The Tree of Life was intended to feed the life that God had breathed into Adam and Eve. We now have a replacement for the food of that tree. That food is God Himself as the Bread of Life in the Eucharist. Adam’s disobedience regarding the command not to eat of the Tree of the Knowledge of Good and Evil was the cause of mankind’s fall from grace. Now that man knows of evil, God has given us something to teach us to distinguish the evil from the good. Of this tree we also have a new bread to eat, as Jesus himself told us, “Not by bread alone (temporal bread) doth man live, but by every word that proceedeth from the mouth of God.” The word of God is two things, scripture and Jesus—especially in the Eucharist. These two foods are essential to us to sustain our life of grace that will, hopefully, lead us to eternal life. At Saint Benedict Center both Father Leonard and Brother Francis passed on to us a deep and abiding love for the word of God in all its forms. Daily reading in the scriptures is the best way for a Christian to partake of this bread that God has given us. On Palm Sunday, 1978, through the kind offices of a friend of the Center, Brother Francis gave us this daily schedule. Some have followed it ever since, and can testify to the sweetness and depth that this practice can bring to one’s spiritual life. 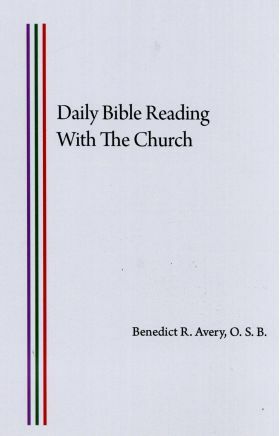 We at Loreto Publications heartily recommend the fifteen minutes of daily reading of scripture outlined in this priceless little publication. Regular faithfulness in small things brings big rewards! Why wait? Begin today and do not give up! Loreto suggests the Douay Rheims version of the English bible as the very best translation available from which to read scripture. It corresponds more accurately to the original Vulgate than any of the more recent translations and the language is most beautiful. The Haydock version also has copious footnotes and commentary from the Fathers.